‘Tis the time of year when many a get-together is had, and for those inclined, many a multiplayer gaming session is undertaken. While it’s hard to beat party staples such as Mario Kart and Jackbox, this last few months have seen a bigger push for same-couch multiplayer experiences than recent years. With Sony’s recent PlayLink initiative and the hilarious Gang Beasts currently in my permanent party rotation, Ultimate Chicken Horse would have to make a lasting impression to make the cut. 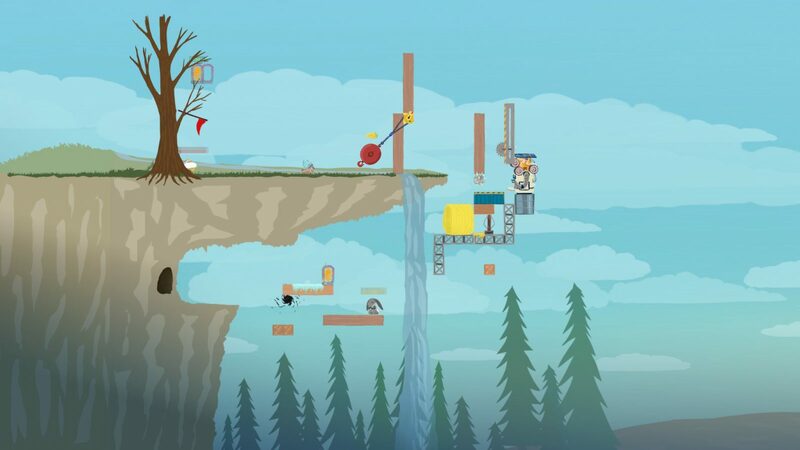 At a basic level, Ultimate Chicken Horse is a competitive 2D platformer that sees participants competing to be the first to traverse a small, usually single-screen level, earning points over multiple runs until a winner is crowned. The gimmick here is that before each run players are given an opportunity to place an object in the level that will either help them reach the goal, or serve to hinder their competitors’ progress. Objects range from simple platforms to dastardly traps, and most can be combined in inventive ways to create some truly devious combinations. 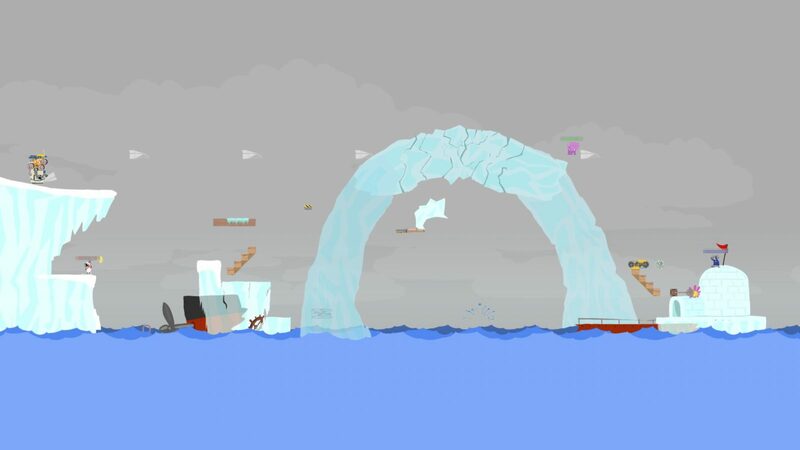 After multiple rounds, what begins as a very simple trip from A to B can become a seemingly-impossible gauntlet of deadly Super Meat Boy-style obstacles. There are multiple rulesets for competitive play, which can easily be tweaked before each game a la Smash Bros, with the main two being Party and Creative mode. Party mode presents players with only a handful of random items to choose from before each run, while Creative mode opens up the entire pallet of doodads with which to cause chaos. Party is definitely the mode of choice for casual couch play, keeping games fast-paced and chaotic (see; funny) and somewhat fair between new and seasoned players. Those looking for more high level, skilled play will find jumping online in Creative mode to be the optimal choice, where combining different items and strategies can result in some surprisingly smart plays and stiff competition awaits. If there’s a downside to all of this, it’s that Ultimate Chicken Horse does a terrible job of explaining itself. Rather, it doesn’t attempt to do so at all. There are no tutorials, and there’s nothing in the way of a single player mode to learn even the basics in. The result is that the game requires some learning by trial-and-error, which is mostly fine in a group full of patient local players, but for anyone whose first games are being played online it leads to a painful first few attempts. Realistically, the audience for this game is undoubtedly those shooting for skilled online competition and leaderboard bragging rights, but catering to casual players could have made for essential party play as well. Rounding out the competitive offerings are a Challenge mode where players compete for the fastest times in purpose-built levels and Free Play, where players are given free reign to make their own custom levels which can be saved and uploaded for use in other modes. As with the rest of UCH, these will appeal mainly to those who invest serious time in the game. The game has a great, cut-and-paste cartoon aesthetic that goes hand-in-hand with simple and responsive controls, but everything is tied together in an annoyingly inconvenient hub map. Selecting levels, changing certain modifiers and switching game modes is done in-game by way of traversing a treehouse that grows as more levels are unlocked, which is cute at first but pretty quickly had me wishing for an optional, traditional menu with which to quickly jump into what I wanted. It’s a minor annoyance, and I’m sure the game’s fanbase is into it, but for me it pushed Ultimate Chicken Horse further outside the realm of casual party title. 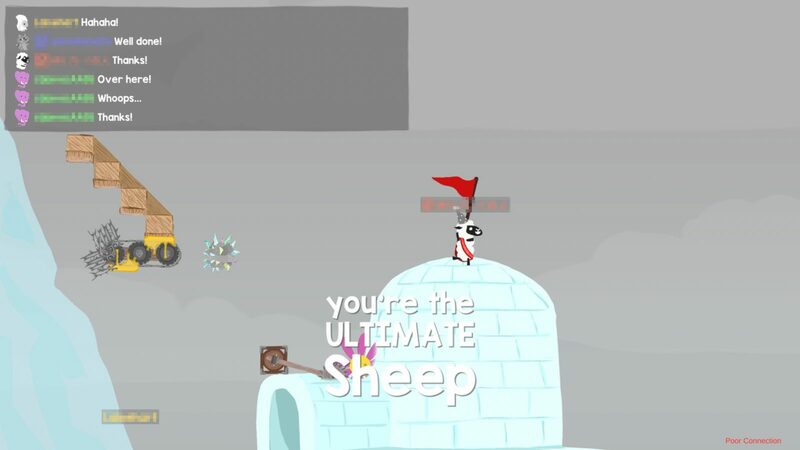 Ultimate Chicken Horse is an addictive and surprisingly nuanced competitive platformer that shines in skilled online play, but fails as a couch multiplayer game thanks to a combination of a lack of coaching and confusing menu systems that will try the patience of casual players in a party setting. If creating Super Meat Boy-esque levels on the fly to screw over people on the internet sounds like your bag though, this might be the game for you.